Someone tweeted about this and I thought it was simply Made of Win. 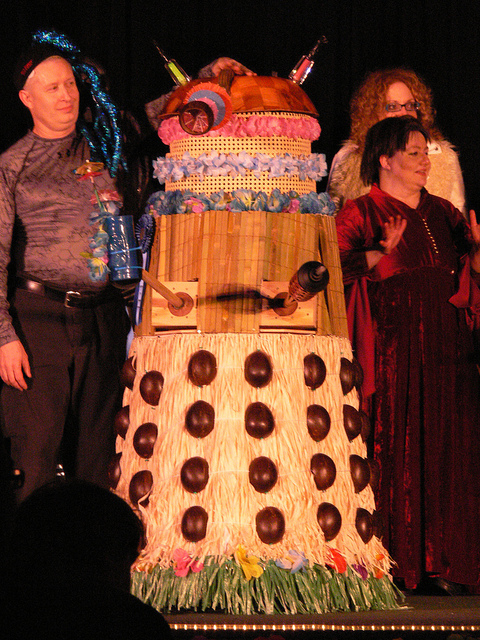 Yes, I’m talking about the TIKI DALEK. In this creation two completely disparate things have been brought together to create poetry in motion. The materials fit the structure so perfectly that one could believe Daleks were MEANT to be made out of cane, coconuts and raffia. Built for the Gallifry One Doctor Who Convention by Kevin Roche it took humor, imagination and skill, deservedly winning the costume prize at the Masquerade of Mandragora. As a Doctor Who fan it brings joy to my heart. The Pineapple Dalek-gun and cocktail complete with mini umbrellas cracks me up, as do the hawaiian floral wreaths. They give this Dalek such a fun-loving, party-going personality. I’d love to join it in the conga line.